When fifty years ago, the young Paul Rivera began to repair and modernize amplifiers in his New York store, nobody even imagined that 50 years later, the name Rivera would be synonymous with sound quality and innovation. To celebrate half a century of activity, Paul decided to refresh the RockCrusher power attenuator. Rivera RockCrusher is a power attenuator designed to tame powerful tube designs. Often at home or on small stages, guitarists struggle with the dilemma: spin your tube favorite to fully enjoy the tonal qualities or turn it down to spare mercifully the first rows of fans, while simultaneously suppressing the sound potential of the structure. In order for the tube construction to give us all the best, it is not enough just to give it all on the preamplifier section, but also the power amp running at full speed. 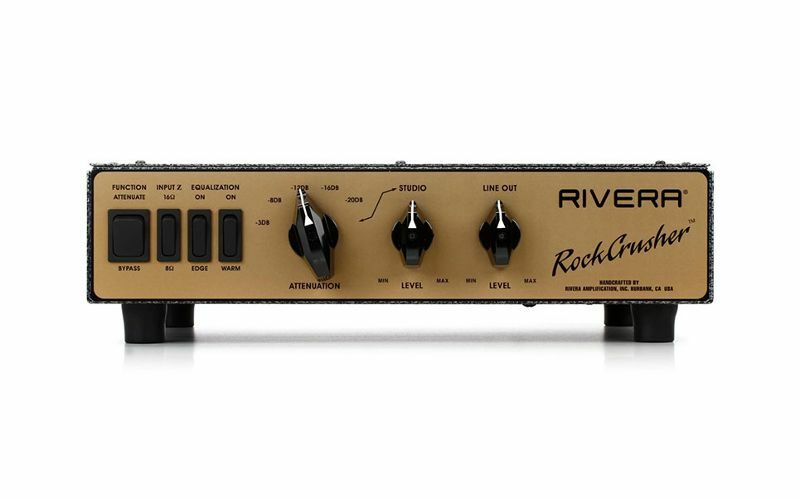 RockCrusher gives user to control the powerful power of our tube amps. Located in the signal path between the amplifier and the column, it allows us to enjoy the tube sound at low volume levels or, if the column is removed from the signal path, it will take over the resistance of the column. In addition, the anniversary special edition of RockCrusher impresses with a beautiful, golden finish.